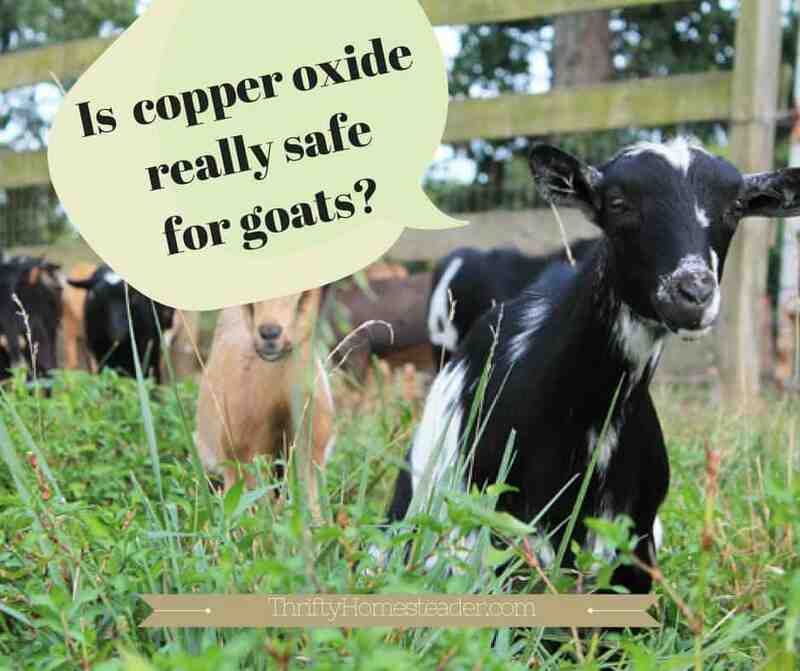 Is copper oxide really safe for goats? More than ten years ago when my goats had severe fertility problems, and my bucks all died before the age of three, an experienced breeder suggested that we might have a problem with copper deficiency. My teenage daughter did a lot of reading and agreed. But when I called the vet to ask for an injectable copper supplement, he insisted that copper deficiency was impossible if my goats were eating a commercial goat feed and had access to free choice minerals. So, I called another vet who said the same thing. Ultimately four vets said the same thing, which really scared me away from the idea of supplementing my goats with copper oxide wire particles, which were available from livestock supply catalogs. Ultimately a liver analysis of a dead goat proved that we did have a problem with copper deficiency. The vet still refused to give me the prescription copper, so I started using copper oxide wire particles (COWP), which are often called copper boluses. Back then I had to buy calf boluses, tear them apart, and then redistribute the copper into goat-sized doses. Over the past decade, however, copper deficiency in goats has become more commonly accepted as a real problem, and goat boluses are commercially available. However, I still hear a lot of people ask if it’s safe. I’ve personally read more than 15 studies done on copper oxide wire particles used as a dewormer in sheep and goats, and there was never a single case of toxicity in any of those studies, even in the sheep, which have a much lower tolerance to copper toxicity than goats do. However, most of those studies only had a couple dozen goats or sheep in them, so I was still curious about what was happening in real herds. 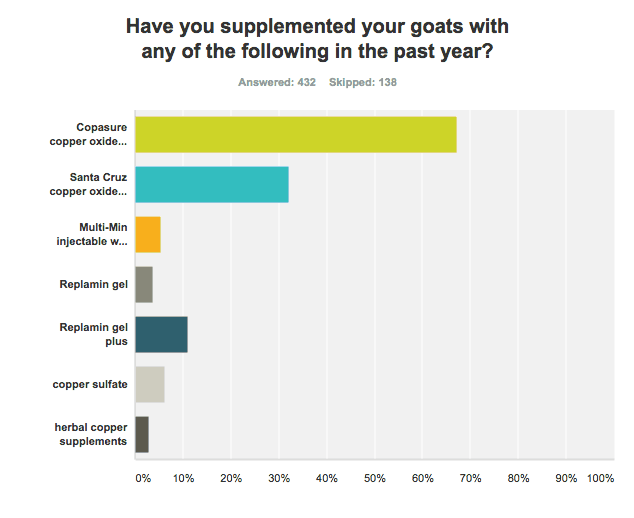 Last month, I created a survey to learn what goat breeders are doing in their herds with copper supplementation. It will take some time to tease apart all of the data, but one thing became clear very quickly. Copper oxide wire particles are safe. she was poisoned with copper sulfate at a show in 2013 she was winning everything. Coppasure, dosage at 1 g/22 lb, was late 1-2 months on receiving next dose at 2x/year dose rate. 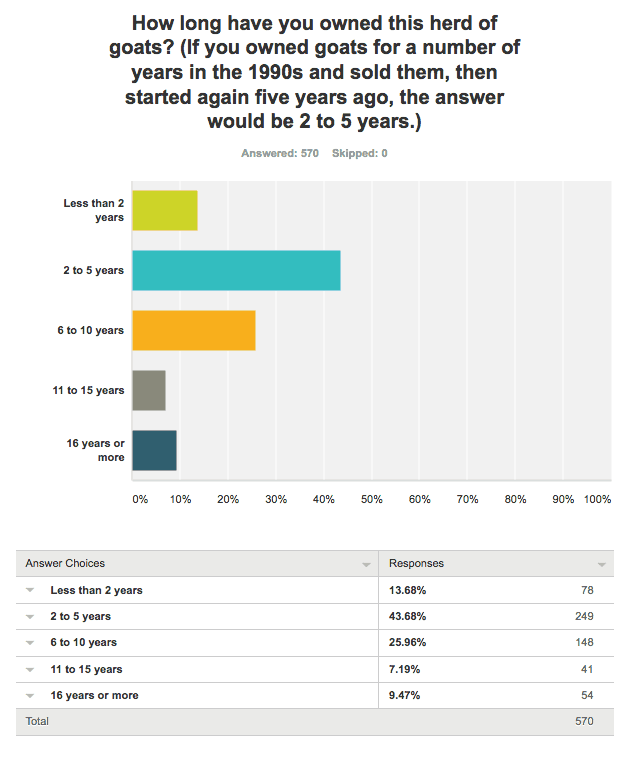 It appears the person who responded with the second answer may have accidentally responded “yes” because in response to the question that asked about frequency of using COWP, he or she also said, “Switching to 3x/year because 2x/year did not seem to be enough,” and this person also reported having a goat die from copper deficiency confirmed by lab analysis. 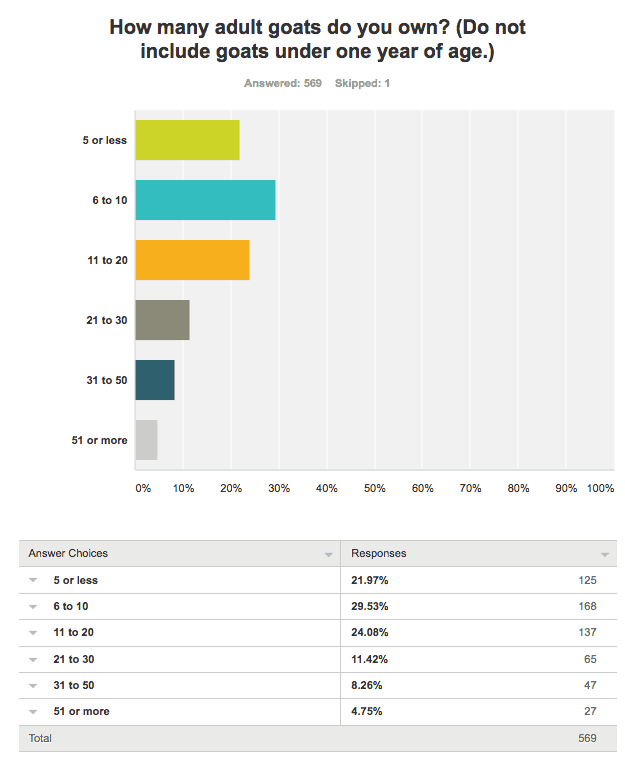 Unfortunately this respondent did not include their email address, so I can’t follow-up. The person who left the second comment probably did not have a goat that died of copper toxicity because there are no known hays or grains that contain toxic amounts of copper. Since they were giving no supplements, it could mean that the goat actually died from copper deficiency. Almost everyone dosed the COWP at 1 gram per 22 pounds or simply followed the manufacturer’s recommendation of one small bolus for kids and one large bolus for adults. There were a few people who dosed at higher rates, but this will take more time to analyze because the responses were written out. How many goats are represented by this survey? If you average the herd size and multiply it times the number of respondents in each group, it comes out to almost 8,500 goats that the respondents own right now. When you consider the fact that 95 respondents have owned goats for more than ten years, that multiplies the number of goats even more. So it appears that copper oxide wire particles are extremely safe, even if one goat died from toxicity, which is questionable based upon that respondent’s other answers. I’ll continue to crunch the data on the survey over the next few weeks and provide you with additional information, including symptoms of copper deficiency, diet, and mineral supplementation. 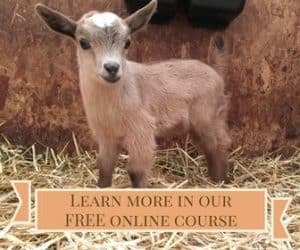 You can learn more in my free online course, Copper Deficiency in Goats, by clicking on the link. It includes live videos, PowerPoint lectures, and handouts. This is great news, and so interesting to see the other peoples’ responses. Thank you so much for sharing! A little history–There is a lady in southern California, Joyce Lazzaro, who did countless studies on copper deficiency in goats. She is responsible for introducing the importance of added copper to our goats diet way back in the 80’s. There is another lady that has done extreme studies on copper deficiency, Willi Boepple in Canadia. Willi is on Saanen Talk. These ladies have shared their knowledge with goat breeders and vets for years. I myself started using coppasure more then 35 years ago. I now use Muilti Min 90 which I have used for over five years. We had llamas for 9 years, and they never had a problem with copper deficiency, and they didn’t even have loose minerals available all the time. I imagine give them COWP would be a lot more challenging than giving it to a goat. I’d definitely try to do it the way that I show in the video in my copper course (adding it to food). But I’m not sure that llamas need that much copper. I use multimin 90 too, previously used copasure. My herd has no parasite problems so I switched to multimin with great results. We are very copper and selenium deficient here . If we were having worm problems I would also bolus for the local, in rumen effect on worms. How young are baby goats when you dose the COWP? 1 month? If the mothers are not copper deficient, and the babies are still nursing, they are fine. I don’t usually give them COWP until they are weaned or until they are about 3-4 months old. They don’t usually have a problem with deficiency until they start drinking a lot of our water, which has high mineral content. Thank you! Can you tell me what size empty gel capsule I need to break down the large 12.5 gram COWP? Not sure what size I need to hold 2-4 grams. Size 0 holds 2 grams, and size 1 holds 1 gram. Capsules are sized weird — smaller is bigger. Thank you so very much for the information. More goat owners need to have all of this information available to them. I will post this site on TGS forms and hopefully more goat owners will realize the need for copper. This has open my eyes to the need even though I give COWP to my goats on a 6 months rotation . Now I may find the need to give copper more often. Thanks again. Fairly new goat owners here… we started right off on a regiment of monthly bolusing… as a anti parasitic along with herbal forms. but have weaned off the herbal and find the copper is all we need! We have very high iron and sulfur amongst who knows what else water tho… and have to supplement their feed (hay) with maybe 20% alfalfa at this time as well. Weve seen such health improvements since weve owned our only (only…so far) two does… even tho the previous owner swore they didnt need copper and were fine. there was some slightly high parasite… slight fishtailing… and dull slight copper hue to their coats. but beyond that… just so much healthier acting. I get really nervous when I hear people talk about giving copper oxide more often than every 3 months. Maybe you are giving a much lower dose so that it comes out to being the same as if you were doing the usual dose every three months? In parasite studies when they do monthly dosing, they only do it for a total of 3 or 4 months, then they are not doing it again until the next year during worm season. If you keep dosing at the usual rate on a monthly schedule, you will eventually have a toxic build up of copper in the liver, which could kill the goats. 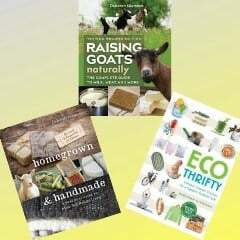 I am the author of Farming Meat Goats: Breeding , Production and Marketing for CSIRO Australia. I would caution breeders to be very careful of copper supplementation. Unless there are obvious signs of deficiency such as dark hair turning reddish, the coat starring and starting to feel like a hard bristled brush, aborting does and so on, I would caution great care using this therapy. The reason is, that excess copper is stored in the liver and when there is so much stored that the liver can hold no more, it is released all at once into the blood stream and the goat will collapse and die suddenly. It will be thought that perhaps a snake may have bitten it or that perhaps it has died of some other reason, However, at autopsy it is found that the bloodstream is full of copper. So unless you have a soil test done which shows copper deficiency or the goats are showing signs of deficiency, I would have a vet do a blood test on the goats before ad-hoc supplementation. Of course, no one should provide a supplement for no good reason. 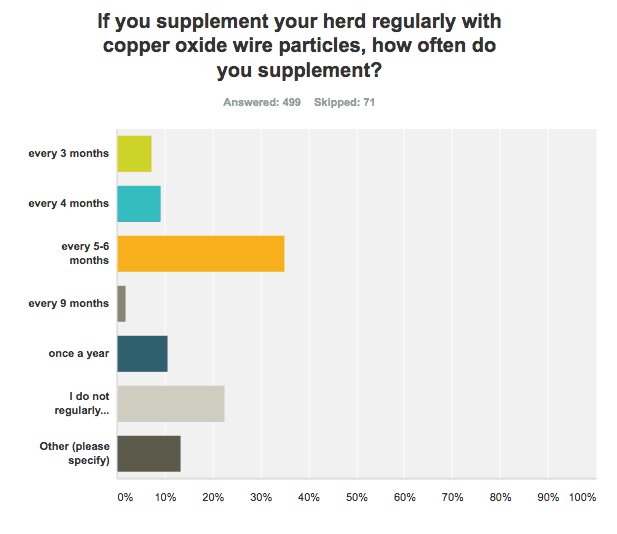 There are multiple other articles on this site about proper use of copper supplementation. This particular type of copper — copper oxide wire particles — have also been shown safe to use in sheep in more than a dozen studies where they were given to sheep to combat barber pole worm, which was one of the reasons I started giving them to my goats. It is much easier to OD sheep on copper than goats, as they are much more sensitive to it and need far less than goats. In fact, one complaint of some people is that copper oxide is not very well absorbed — but that is only if you are comparing it to copper sulfate, which is what was used in most studies of copper toxicity. Also, I suggest that people do liver samples on butchered kids or a goat that dies to get an idea of their copper status, as blood tests for this particular mineral are not really helpful and often give a false sense of security because the numbers tend to run high, so a deficient goat may have a normal serum level.